Born from a love of long-distance touring, Horizons is a fully dynamic location-based photo gallery displaying adventure photography within the context of its geographical location. Populated with over 50,000 map tiles custom processed from NASA’s Blue Marble project and raw LandSAT-7 data, Horizons covers the entire world down to 15m resolution with spatial regions that zoom in even closer. 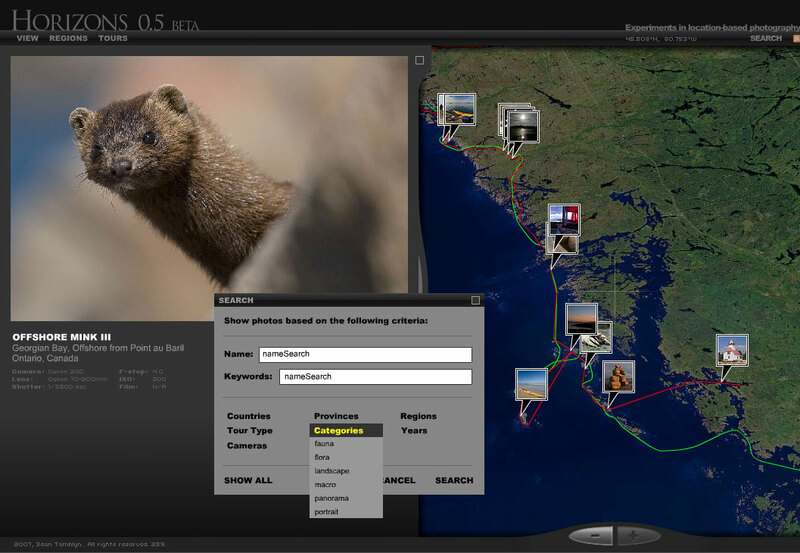 Above: a fully dynamic search panel reveals different types of photography in Georgian Bay. Featuring a fully scaleable and dynamic interface, Horizons can take advantage of everything that the largest displays have to offer. Powered by XML, adding photography, maps, and regions is as simple as changing a few lines of text — no modifications to the core Flash movie are necessary, so site updates are near-instantaneous. Click here to launch Horizons Beta in a new window. This entry was posted on Thursday, October 27th, 2011 at 2:27 pm. It is filed under Visual Application Development and tagged with ActionScript 2.0, Adobe Flash 8, XML. You can follow any responses to this entry through the RSS 2.0 feed.